Whew! I had bought this months ago and it just stayed on my kindle, forgotten, until recently. I'm so glad I finally read it. Most New Adult stories tend to have at least a couple of super sappy parts. This was not the case at all. And while I'm a fan of a little sap that makes you go "Aw, that's so sweet!" and gives you a little flutter, it was a nice change for me. I mean there were parts where I did think "Aw" but it wasn't a super sweet read. It was real. I think that's what made it so great for me. Both Layken and Will were very realistic, believable characters. 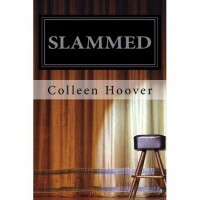 Based on the title, I thought that the poetry slams might have appeared a little more in the story. However I'm glad that didn't turn out to be the case simply because I think it would have thrown the book off balance. I'm not one to typically re-read books, but I'd seriously consider re-reading this one.